Here’s how to fix Windows 10 Anniversary Update Error 0x80070057 ‘Something went wrong’ during update installation. Windows 10 Anniversary update has brought a lot of new changes to the functioning of the latest Windows OS from Microsoft. If you want to get the best of all new features then download Windows 10 Anniversary update ISO file from Microsoft’s official page. But on some PCs, Windows 10 anniversary update is not installing smoothly, some users are reporting that they are getting Error 0x80070057 while installing anniversary update. Many contributing factors are responsible for this Windows 10 update error, chief among which is the complexity of the modern operating systems and codes which makes it difficult for rolling out new updates on a large-scale without errors. Luckily, there is an easy way to fix Windows 10 0x80070057 error during anniversary update installation on Windows 10. In the past when things were more manageable, such update errors were a rare occurrence, unfortunately, this is not the case anymore, especially when many upgraded to Windows 10 or still using it on older PC hardware. Windows 10 anniversary update is the biggest OS update rolled out by Microsoft to date, and as with any such large-scale software update, some errors are expected to arise. After identifying errors with anniversary update, we worked to find a solution to this irritating ‘Something Went Wrong’ Anniversary update error which you can see below to fix 0x80070057 error. 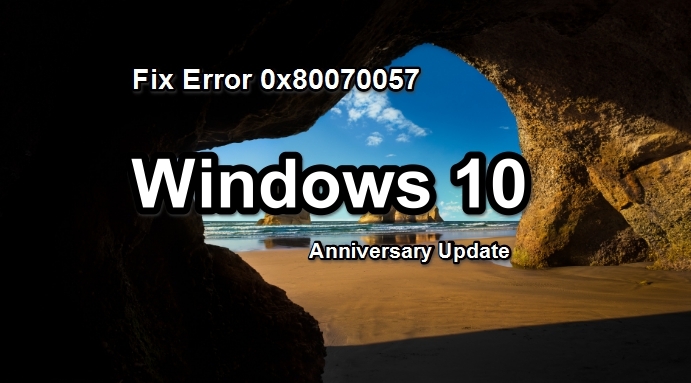 Many regular readers of our blog pointed out that they have been getting 0x80070057 error while trying to install Windows 10 anniversary update. Microsoft doesn’t provide reasons behind such errors and mostly it is left to users to find the solution and troubleshoot the problem. 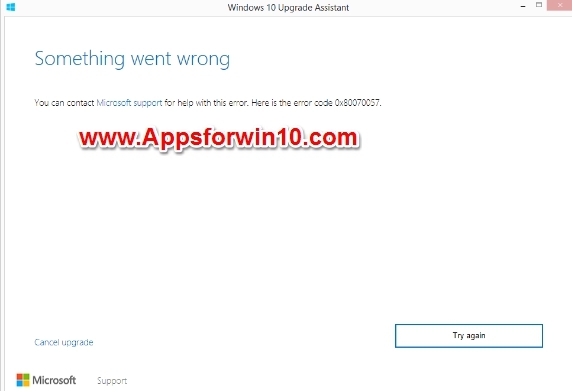 This new error is occurring after you download Anniversary update files using Windows 10 update assistant tool and get ready to install them on PC. When this error occurs on a PC, your computer screen gets frozen at 0% loading for a long time before showing error code 0x80070057 ‘Some Went Wrong’ message. Disable Internet access, LAN/WAN or any other network connection to the PC during Anniversary update file verification by the Windows 10 installer. Disconnect all internet access to the computer during installer verification of the anniversary update files after which you won’t see this error message 0x80070057 on the screen and the update process will continue as normal. That’s all. You have successfully fixed Windows 10 anniversary update error 0x080070057 and won’t see it again during the update process. Stay tuned for more Windows 10 Anniversary update fixes. Any queries? Please do share your thoughts in the comments section below, if the problem still persists we will do our best to find the fix for you.